I was reading this month’s Bon Appetit, an article about the new 5-2 Diet, when I saw it. In an interview, Michael Mosley answered a question about its long-term effectiveness of his feast/fast diet by saying, “The proof is in the pudding.” While I’m used to seeing this meaningless abbreviation of the original phrase, it really jumped off the page in a magazine about food, like @bonappetit. We Americans like to shorten things. A lot. We abbreviate, we create acronyms, we put together sets of initials and call them acronyms, we use codes and invent shorthand for longer expressions. It’s just what we do—saving time for more important things, like Twitter or watching cat videos on YouTube. But sometimes the real meaning of a phrase gets lost in all that shrinking and trimming. Here’s the real story behind tasteless pudding and edgeless envelopes. Tasteless Pudding: The original phrase is, “The proof of the pudding is in the taste.” Sometimes, it’s expressed as, “the proof of the pudding is in the eating.” There, now, that wasn’t so long or difficult, was it? And, wow, this way it makes sense because what could “the proof is in the pudding” possibly mean? Most folks would interpret it to mean that “the quality, effectiveness or truth of something can only be judged by putting it into action or to its intended use,” but that’s a stretch. In the original form, it’s a very old phrase. The Oxford Dictionary of Quotations places it in the 14th century and it is widely attributed to Cervantes through a loose translation of The History of Don Quixote. Proof in this context means to test, as in proving yeast by letting it stand in warm water to determine whether it’s active. In this form, it simply means that the quality of something is uncertain until it has been tested directly. Back in the 14th century, of course, a pudding would have been a savory dish, not a sweet dessert, and more like a sausage (or a haggis) than @JELLO Instant Chocolate Fudge in a box. A recipe for such a medieval pudding would call for the stomach or entrails or an animal (pig, sheep, etc.) washed clean and stuffed with a mixture of minced meat, fat (usually suet), oatmeal and seasonings, then tied off at the ends and boiled. That makes it even more important for the pudding to taste good. Who wants to eat an insipid sausage? 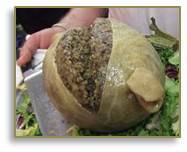 Or a bland haggis? 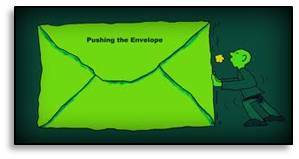 Edgeless Envelope: Another, more recent phrase that gets shortened into meaningless gibberish is, “Pushing the envelope.” Again, what does this mean? Who would push an envelope? What for? How far do you push it? What happens if you don’t push the envelope far enough? Well, the original phrase is, “Pushing the edge of the envelope.” I have seen some definitions that try to make sense of the shortened version in the context of letters but, really, how ridiculous is that? Even Sisyphus pushed a rock, not an envelope. It generally refers the known limits for the safe performance of the aircraft, which get dicier the higher it goes. But pushing those limits is what test pilots are paid to do. When I first encountered this phrase in @aviationweek magazine (where I was placing ads for my company) it referred to the space plane, which could fly to utmost limits of the atmosphere, where it touches space. Doesn’t that make more sense? Isn’t it a better metaphor? Doesn’t it feel, well, edgier? Now, you might not care about etymology, history, recipes, sheep stomachs or test pilots, but I hope you will think twice before uttering one of the shortened versions of these phrases and then say it correctly. Trust me, you’ll sound wiser and more educated if you do.